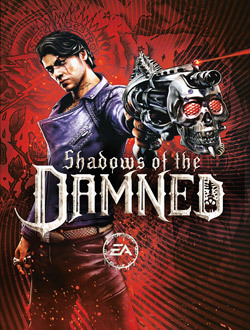 Shadows of the Damned, officially abbreviated as Damned or DMD, is an upcoming 2011 video game developed by Grasshopper Manufacture and published by Electronic Arts for the PlayStation 3 and Xbox 360 video game consoles. The game follows the story of Garcia Hotspur who goes to hell to battle its evils in order to save his true love. The game is the result of collaboration between Goichi Suda and Shinji Mikami, and will combine the styles of the two producers, namely the "punk rock" edge of the former and the "psychological action thriller" of the latter. This game comes out today, do you care? This game just looks like an absolute nightmare. I can't wait to play it. The official launch trailer for Shadows of the Damned. Join Garcia on his journey through hell as he beats on the dead and tries to save his girlfriend. Shadows of the Damned will help you "Enlarge your Johnson"
New Shadows of the Damned Trailer released. Gives us a look at several guns and how they are altered. Was that infomercial enough for you? Pretty comedic. Tell us what you think about the trailer or even better, how is this game coming together for you? Destructoid has taken the pleasure in creating a great video preview for Grasshopper Manufacture's upcoming game. For the longest time all we have gotten form this game are screenshots, a few details and the videos were always short and didn't clearly show the feel of the game. Luckily over at Destructoid.com , they got to play through the first couple of levels, and created a nice video preview for all of us curious cats. Seeing this has definitely got me more interested in the game. Check out the vid below and tell us what you think. Is this something you would buy or maybe try out?